Despite these benefits, the eBook format can still seem a little daunting to marketers and that’s mostly because of the perception that eBooks are reserved for professional publishers and authors who make their living from writing books. This article will highlight the main differences between a marketing eBook and a traditional eBook in an effort to dispel some of the myths that are holding marketers back from launching their own eBook campaign. We will look at a number of key features that answer the question: What is a content marketing eBook? There are a range of different file types for an eBook including epub, mobi, PDF and HTML5 to name but a few. While this can seem confusing at first it is important to remember that you do not need to publish in all of these formats – you should choose the one that best suits your content, your business goals and your audience. For example, if you wanted to include embedded video in your eBook then you should avoid PDF as it doesn’t support multimedia elements. The PDF format is familiar to most people, is easy to produce and is used for a wide range of things online, not just eBooks. Pro: Full control of design and no specialist software required to read. Con: Not multimedia friendly and file sizes can be quite large. This format is more commonly used for websites so like PDFs it is not an eBook only format. Pro: Fast loading times and opportunity to add interactive elements. Con: Not always available to download and store offline. This is the file format of the most popular eBook reader – the Kindle. Pro: You can sell your eBooks on the Kindle store. Con: People will need a Kindle to read your book. Most traditional eBooks are published in this open source format. Pro: Relatively easy to create. Con: Limited options for engaging design. Marketing eBooks are most commonly seen in the pdf or HTML5 format as they don’t require specialist software in order to read them. 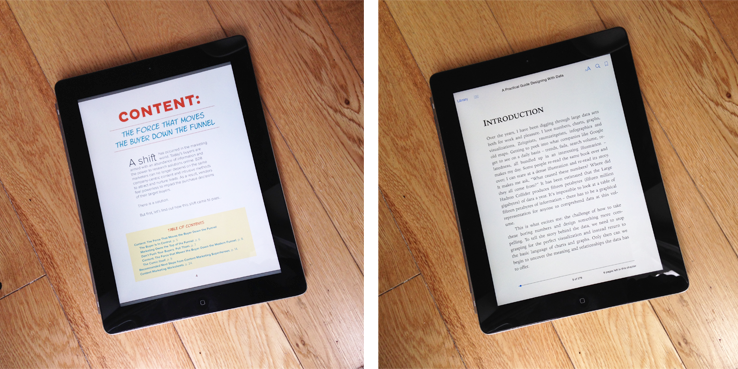 This helps to maximise the audience for your book as you won’t be excluding anyone who doesn’t own an eBook reader. The primary difference between a marketing eBook and a traditional eBook is the price tag. For the most part, marketers don’t ask for payment in exchange for their book – instead, a simple email address will suffice. This works out well for everyone – the reader gets quality content for free and the author gets a new email address for future marketing campaigns. That’s not to say that free eBooks are any less valuable than paid ones. B2B marketers like Hubspot,Intercom and Kapost are giving away detailed, thoroughly researched content that is on a par with (and sometimes better than) any expensive business books that I’ve bought over the years. There are of course some exceptions to the free vs paid eBook rule – Nathan Barry for example uses his eBooks for both marketing and revenue generation. If you do plan to sell your eBook you can use a tool like Gumroad which will handle all the credit card processing, file storage and delivery. With this in mind, you’re unlikely to make money by selling a marketing eBook unless you already have a loyal following. Of course It will be difficult to use your eBook to create a following if you’re charging people for it. If you are toying with the idea of selling a business eBook then I would recommend starting with a series of free eBooks to see if your audience has the appetite for a paid version. This is an important one. Marketing eBooks are primarily used as learning aids and so they should be visually engaging, with imagery to help soften the content and explain complicated ideas. In contrast, traditional eBooks are mostly text based with little in the way of superfluous design or decoration. You can see the difference between a marketing eBook and a traditional eBook in the screenshot below. Which would you rather use as a learning resource? Which is your audience more likely to respond to? There are a number of factors that combine to make an eBook’s design; including colour, photography, page layout and typography. And this is where many marketers get stuck. Because while most people can spot a bad design from a mile off, it’s difficult to create good design from scratch. These days there are a number of tools that help make good design a bit more accessible to marketers. Tools like Canva and Beacon both aim to simplify complex design principles so marketers can quickly create professional designs without necessarily understanding the theory behind it. Traditional eBooks can usually be found in digital book stores like Amazon or iTunes. While marketing eBooks will generally be self hosted on the company’s website – like in this resources section of the Kissmetrics website. Your aim as a marketer is to put your content where your audience is most likely to find it. Since people will be searching for the problem they are trying to solve rather than the title of a book it makes sense to make your book available on open web rather than in a closed marketplace like Amazon. The content within both PDF and HTML5 formats can be indexed by search engines, while epub and mobi can’t. This is another important consideration to make – if you want your content to find its way into people outside of your core network then you’ll need to optimise for search. Self hosted eBooks will give you much greater flexibility in how you can encourage people to download it. Since you are in complete control of the layout, copy and design you can tweak these to optimise downloads. Closed marketplaces obviously won’t give you the same freedom. Short extracts from the book and testimonials from happy readers will all help to persuade people of the quality of your content before they commit to downloading it. Even for a free book it’s important to be clear about the value you’re offering, otherwise people are unlikely to download at all. For tips on how to optimise an eBook landing page for conversions check out this article by the team at Unbounce. If you’re making a marketing eBook then chances are you’re not aiming for the New York Times bestseller list, rather your success will be quantified in a different way. Downloads, leads generated and an increased social media following might be some of the goals that you set for your eBook campaign. If you’re producing an eBook for the purpose of lead generation then it’s important to remember that you can’t perform data capture through a marketplace like Amazon. While you will be able to measure how many people download your book, you won’t be able to see who these are or have access to their contact details. If you want to offer your eBook as an incentive for people to join your mailing list then a landing page or a data capture widget are your best friends. Check out Sumo.com for a range of data capture options that are easy to integrate with your blog. Alternatively, if your aim is to grow your Twitter following then you might want to check out Pay With a Tweet. This handy tool prompts readers to tweet a referral link to your eBook before they can download it. A handy way to help your eBook go viral since you can tap into your reader’s followers as well as your own. So, what is a content marketing eBook? Marketing eBooks and traditional eBooks generally vary in length, design and type of content. If you plan to create an eBook for the purposes of marketing then the process can be really straightforward, just remember to make sure that the file format, design and distribution channels are all in line with both your business and customer goals.